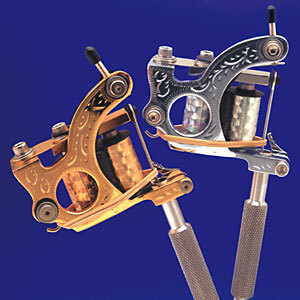 This deluxe tattoo machine is supreme quality throughout. Exquisite hand engraving by professional craftsmen make it a unique piece of equipment and no two are identical. The frame is an investment casting and is available in two models. Model #1 is chrome-plated. In Model #2 the frame, binding posts, two piece springs, and armature bar are gold-plated. The Supreme Deluxe is a Quick Change Machine with our patented LeeverLoc™ fastener device. All hardware is stainless steel with lowhead caphead screws. Included is a handsome Redwood presentation case with any one of the listed tube and needle bar combinations. Please specify when ordering.